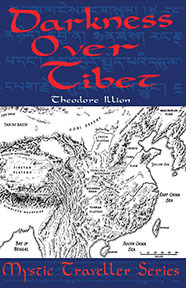 In this second reprint of Illion's rare books, the German traveller continues his journey through Tibet and is given directions to a strange underground city. As the original publishers remarks said, "this is a rare account of an underground city in Tibet by the only Westerner ever to enter it and escape alive." A bizarre book on black magicians in Tibet and a legendary underground world where visitors rarely are able to leave. DARKNESS OVER TIBET By Theodore Illion. 210 pages. 5x9 Paperback. Illustrated.